I thought I knew a fair bit about Will Eisner. Many of his comics that I've read are at least quasi-autobiographical, and I had read interviews with other comic writers about his influence on their work. This book sets out to give greater insight into a comics pioneer. The subtitle is "A Dreamer's Life in Comics" and most of the book focuses on his work, not only on the comics that bear his name, but also on armed services safety manuals and other commercial work. Eisner may have been a dreamer, but the book emphasizes his pragmatism; he was proud of his business acumen, and made sure that was part of what he passed on to the young comic artists he mentored. While other artists signed their work away, he made sure he understood every aspect of the business and how it pertained to his property. Unlike many of his generation, he worked all sides of the business.The book has a couple of flaws. It includes some photos and art, but not nearly enough. It often describes comic panels in great detail rather than simply printing the panel, ironic given the time devoted to quotes such as this one, from Rodolphe Topffer:"The drawings without their text would have only vague meaning; the text, without the drawings, would have non meaning at all. The combination of the two makes a kind of novel. "I knew the breadth and scope of Eisner's work, but the other thing I had not previously realized was the extent to which he wanted to break new ground. I had somehow assumed that he was a pioneer because he was the first to do what he did; I didn't realize that he did it because he wanted to be a pioneer, if that makes sense. He worked until the last days of his life, striving and experimenting and breaking new ground.In an interview about his favorite Spirit installment, "The Story of Gerhard Shnobble," Eisner said "The theme I was working with is that everyone, no matter how small they seem, has a moment of glory. I'm fascinated by the fact that the world has billions of people, each of whom does small things. And I'm convinced that small acts can have huge ramifications. I just can't get out of my mind the belief that our existence is part of a larger scheme." Schumacher does an excellent job of explaining how Eisner lived that philosophy as well as putting it to paper. Do people who wrote autobiographical stories lend themselves to third party biographies? Do we need a Harvey Pekar biography? Eisner certainly covered the high points/greatest struggles of his life in his work...so I'm not sure the world needed this book.That said, this bio gave more context to Eisner's work than the documentary "Will Eisner Profession: Cartoonist," but almost too much context. In many parts of the book Schumacher shifts the focus away from Eisner to breifly profile other artists, cartoonists, and authors Eisner worked with. While helpful, this really made the bio read as if it were written about the people around Eisner, than the man himself.For a livelier, more personal account of cartooning in Eisner's time and its emergence as an artform I'd recommend Jules Feiffer's memoir "Backing into Forward." Some books call for retrospection, while reading. You see, while I had been a fan of Eisner's output for many years, I knew nothing about him. Sure he created The Spirit and capped his career with The Plot, but what drove him? Who was he? This book exposes that in very pleasant a quick reading prose.For a long time now, there has been a discussion in the comic book industry about who was the inventor of the graphic novel. When I use that term, I'm not referring the books collecting the monthly outputs of the major players, but a book conceived, written/drawn from beginning to end not to be presented serially but to be put together as one coherent piece. Eisner liked to claim that throne while alive, and after his passing and reading this book I have a hard time disagreeing with him.Eisner was never happy with the serial nature of comics nor the marginalized place pop and mass culture placed them. While the book traces his career through many ups and downs and varying experiments, a stint drawing manuals for the US Army just one of these sideline ventures, there appears to be a driving force to create larger and more literary content throughout his career. All his stories are personal if not autobiographical. Often while reading I had to put the book down and reread parts of his work, as I now had a different and more informed viewpoint to look at them through. Schumacher does a wonderful job outlining this undercurrent drive of Eisners and following it till explodes full fledged in the 1970s. While others in the industry tried to keep pulling him back to produce more Spirit material, Eisner never budged after that on what he truly wanted to do -- create more enduring work that left a significant message.His last book The Plot does this. But, more on a review of that book. With the exception of the novel's villains, who are largely caricatures motivated by greed or a lust for power, Eisner's characters in A Life Force are complex individuals trapped in a harsh world of daily survival, forced to make decisions that under other circumstances they might never have faced. They are the victims of life -- not the one they were raised to believe was possible, but the one they are forced to live. The Depression and the European immigration to New York City brought on by Hitler's persecution of the Jews brings into fine focus the way otherwise decent human beings discover sometimes shady ways of surviving. People find ways to rationalize their behavior and overlook the behavior of others, all for the sake of survival. They are no different from the cockroaches scurrying around the dark corners of the city, struggling to stay alive. Having read _Shop Talk_ and the forewords to the KSP versions of Eisner's work, and flipping through the DC versions I thought I knew a lot about Will Eisner. A lot of this book was familiar to me, but the interviews with actual people were in depth and fantastic. The bibliography for this was impressive and the research was extensive.I am quite glad to have won this book from Goodreads.com (there's the government disclaimer) and was planning on releasing this book into the wilds of the local Library, but I'm keeping it. I know I'll be re-reading parts of this book often. I will also look at other Michael Schumacher books like The Edmund Fitzgerald (there's a song about it) and his humor guidebook. Will Eisner's life spanned the history and evolution of comics, from the cheap disposable entertainment of the 1930's to the award winning graphic novels we're familiar with today. Very early on Eisner recognized comics as a unique storytelling medium with potential far beyond what was being produced in the late 1930's. At the age of 19 and with $15 he started his own comics studio where he created his now famous "The Spirit." The biography goes on to cover his life during the war years, the comic book scare of the 1950's and Eisner's own ground-breaking graphic novels. If you liked "The Ten-Cent Plague" or Michael Chabon's "Kavalier and Clay," I think you'll enjoy this one. I won this book in a First Reads giveaway. I'm a big fan of graphic novels and their history and thought I would enjoy this look at one of the pioneers, and I'm pleased to say that I was correct about that. I learned a lot about Will Eisner and his work, and I came away with admiration for both his art and his business sense. He's a great example to artists of all types that you don't have to sign away your art in order to make a living with it. My only quibble with the book is that I would have liked seeing more of his art. Long descriptions of some of his comic panels could have been replaced with his actual work and produced a stronger book in my opinion. This is a fascinating biography of Will Eisner, who had an enormous impact on the early days of comics and the development of the graphic novel later in life. One thing that keeps being mentioned over and over again was that Eisner was a businessman first and foremost. He wouldn't work with anyone unless he had a contract with the details worked out. Most comic artists weren't that great as business people and suffered from their ignorance. I'm really glad I won this book through Good Reads first-reads. It’s not the type of book I would normally pick up but it was really interesting. I'm a big fan of the Contract with God trilogy so it was interesting to learn more about the author’s life. He is a big part of making graphic novels what they are today. In fact he is the person credited with coining the term "Graphic Novel". I would recommend this to anyone interested in the history of graphic novels. It was an ok book, I really like Will Eisner, I am a great comic book fan and all the other books related to it, it was really detailed, but I miss having more pictures of his work, I draw some myself and have always been interested in all of this kind of reading matter. If you are into this kind of art and comic anything this is a good book to have. The book was a pretty comprehensive overview of Eisner's work. I especially liked learning more about the Eisner & Iger shop from the 1930's, a place I'd read about quite a bit in reading other comic histories/biographies, but didn't know that much about. Exemplifying Will Eisner's skills as a businessman and a successful promoter of a more mature vision of comics. Describes much of his later works as erratic in quality and content, but celebrates his support of the art. Wonderful account and real life history of Will Eisner's lifelong quest to have comics accepted as a legitimate art form. Especially fascinating since I was interviewed for the book having witnessed some of this firsthand as a student of Eisner's and then as his studio assistant. I won this book in a First Reads giveaway. I will review it once I've received it, and read it. It's a great biography. Super researched so a little long. Glaring error on the publication of DROPSIE AVENUE. It was published in 1995, not after 9/11. 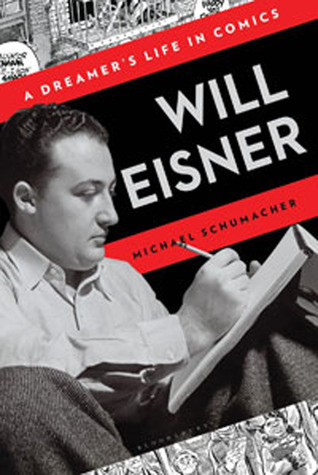 The book is okay, but this is certainly not the biography that Eisner deserves.